Join the RZR engineer team on the Polaris RZR Facebook page on Monday, 10/13 at 8:00pm CDT for a live #RZRCHAT. They’ll be answering your questions about the all new built-for-mudding RZR XP 1000 High Lifter Edition. WHAT: Live chat with the Polaris RZR® engineering team about the new built-for-mudding RZR® XP 1000 High Lifter Edition. HOW: Submit a question that evening using #RZRCHAT. The new RZR XP 1000 High Lifter Edition, built for the true mud rider. 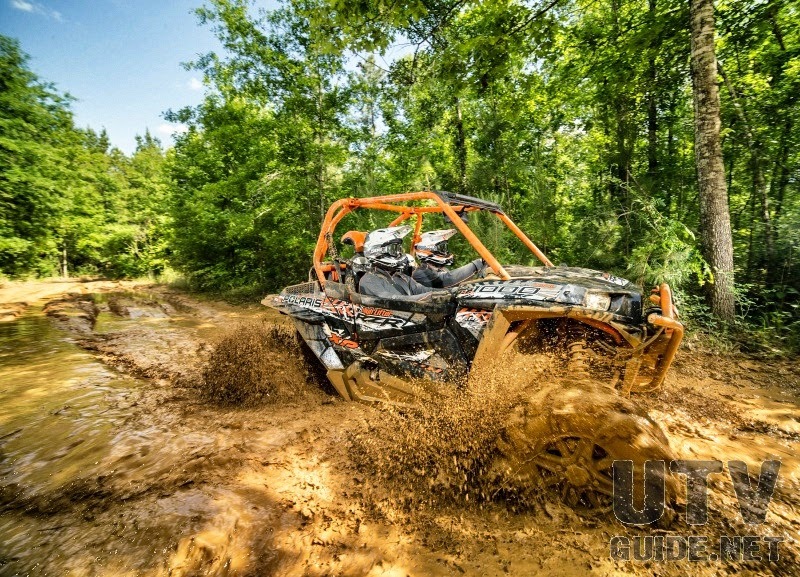 To tackle the mud, Polaris took the vehicle’s massive power from the ProStar 1000 and reduced the gearing for more mud specific torque and added a heavy-duty reverse chain. To ensure the power plant breathes, the unit features high engine air and clutch intakes and outlet which are essential for reliable performance. The redesigned front axles, stiffer suspension springs, higher-clearance lower A-Arms and radius rods, mud-specific Walker Evans shocks, 29.5 in/74.93 cm High Lifter Outlaw II tires and standard EPS provide a suspension and handling that will excel in the mud. Polaris also equipped the vehicle with lower half doors, 4,500 lb/2041.17 kg winch with synthetic rope and integrated in-dash switches, rear-view mirror and a specially designed brushguard that provides higher access to the included winch. The dual A-arm front suspension on the RZR XP 1000 High Lifter Edition delivers a plush 16-inches of travel and features a dual coil-over spring design. By using two individual springs and a crossover point versus a single dual rate spring, the RZR XP 1000 delivers a smooth, precise ride no matter the terrain. Reduced gearing and a larger reverse chain on The RZR XP 1000 High Lifter Edition allows us to optimize power & torque needed for crawling through the mud and put it exactly where you need it most. New Stiffer springs fight back when the mud piles up. Helping you maintain ground clearance as the machine collects mud and overall weight increases. A 4500 lb Polaris Engineered winch comes stock with an integrated dash switch and remote control to help you get out of those sticky situations. Synthetic Rope for more durability in the mud.